Logan Wolf Track had horses in his blood. For this "Indian cowboy," teaming up with army sergeant Mary Tutan to enter the Double D's wild mustang training competition was a win-win proposition. This tough yet vulnerable woman was a natural with horses—and with Logan. She soon had the single father yearning for love and family, something he'd lost when his grown stepsons left home. But as with horses, it wasn't enough for Logan to know how to ride this feeling; he had to know how to fall. And when Mary made a shocking discovery that threw their relationship into question, Logan knew he'd risk all to keep their untamable passion alive…. This is the book I was reading when I left on my brief vacation, and the one that stayed with me. It's the cowboys, the horses and the western setting. They always do it for me. 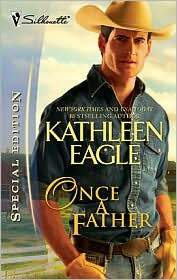 In Once a Father, I really enjoyed the way Eagle's unique character combination and how she portrayed both the "Indian cowboy" hero and army sergeant heroine. Logan Wolf Track is an expert at training wild horses -- he even wrote a book about it -- and he wants to join the Mustang Sally Training Competition. The fact that he's on the Indian Council leasing lands to Sally, however, disqualifies him to enter and win the $20,000 purse. Mary Tutan would also love to enter the competition and she does qualify, but her forte is training dogs in the army, not horses. Her friend Sally comes up with the perfect solution -- Mary will partner up with Logan and she'll enter the competition while he shares his horse training methods with Mary. If they win, they'll split the purse. While Mary is on a 30 day leave from the army to take care of her mother who is ailing, she finds herself torn between wanting to spend her days with Logan training their their horse, and taking care of her mother. Although her mother is sweet and understanding, her father makes things difficult. There's no love lost there. Her father is a man who has emotionally and verbally scarred his entire family. He's also a rancher and has a problems with using good land to save wild mustangs. Mary is a plain looking woman and doesn't think of herself as attractive, but what I like about her is that she doesn't really seem too concerned by it. Logan is immediately attracted to the character he sees on Mary's face and a mutual attraction and sexual pull develops pretty quickly after that. Logan is one of the nicest men I've encountered in a book -- a man with two grown up children, a giver -- and Mary is a strong woman who's still trying to find her true path in life. Together, they make a beautiful couple. The romance itself is heart warming and although there's not a lot of external conflict, I enjoyed the characters and their internal and personal struggles. Although the sexual scenes between Mary and Logan are written in an almost mystical way and not necessarily to my taste, others might find them pleasing and I must say that there's just something about Eagle's writing that I enjoy. The title of the book fits the story, Eagle gave it a bit of a twist that gave this story and characters depth. Eagle's protagonists are warm and down to earth. The story is quite contemporary, and while it centers around Mary and Logan, the plight of the wild mustang in the West is also a focus. Training the chosen horse plays a big role in the story and romance that develops between Mary Tutan and Logan Wolf Track -- Eagle integrates the two in an almost mystical way. Characters from the previous two books in this series make appearances, and I'll be definitely pick up those books. Wonderful review Hils. I read the first book in this series and really need to get back to it. I absolutely love the way you described Logan! And Mary too! Leslie, I remember your review! I also remember I wanted to read that book (In Care of Sam Baudry), now I will. :) Logan and Mary are great characters -- this was a heartwarming (soothing) read. I don't know how else to describe it.